These small, high quality fittings are ideal for connecting tubing and pumps in your fluid handling system. 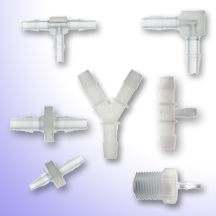 The barbed fittings are designed to securely attach to soft tubing and limit leaking. FTG001 Straight Connector  Great for connecting two soft tubes of the same inner diameter. FTG002 Threaded Adapter  Attach soft tubing to a threaded connection. Choose from three different thread sizes. FTG003 Tee Connector  This fitting connects three sets of tubing together in a T-intersection. FTG004 Elbow  These fittings are similar to straight connectors, except they are bent at 90 degrees. FTG005 Y - Connector  This is a great way to connect three soft tubes at a Y-intersection. FTG006 Straight Reducer  Connect two different sizes of soft tubing to one another. FTG007 Tee Reducer  This T-connector is great for branching a smaller line off of an existing line. FTG008 Elbow Reducer  This elbow connector features two different tubing connector sizes at 90 degrees.